Pursuant to NRS 108.2457(5)(d), this waiver releases all rights of the claimant to place a mechanics lien on the owner's property unconditionally, even if the payment check has been returned or a stop payment order was issued. As such, claimants should issue this type of release only when they are positive their work is done and the payment has cleared their bank. Owners should demand this release when they have paid in full. 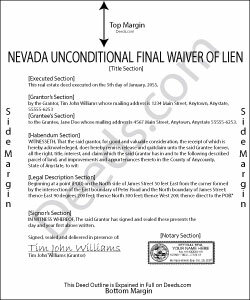 Contact an attorney with questions about this document or other issues related to Nevada mechanic's liens. Deborah B. said: EVERYTHING WENT WELL, HAD NO PROBLEMS DOWNLOADING MY FORMS. THE ORDER QUICK AND EASY. THANKS IF I EVER NEED AND OF THESES FORMS AGAIN I WILL BE BACK. Reply from Staff: Thanks Deborah, we really appreciate your feedback.